In a development that will excite travel enthusiasts across the country, India’s leading travel and leisure platform Cleartrip has launched a special Instagram contest titled Relive Your Memories. Scheduled to run for the full month of April, the exciting social media contest will give participants a chance to win Cleartrip Gift Cards worth INR 1 lakh as Grand Prize, INR 20,000 as Weekly Prize and INR 1,000 as Daily Prize. To participate, users need to follow just three simple steps. 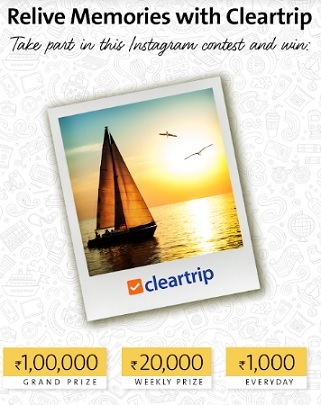 First, they need to follow the official Cleartrip page on Instagram, before posting a photo of their favourite vacation on their personal Instagram page with the hashtags #TravelWithCleartrip #ReliveMemories #CleartripContest #WinRs1Lakh. Then they need to add the location of the vacation and tag the people with whom they want to relive the vacation in the description/comments section. People who tag more friends and get them to follow Cleartrip increase their chances of winning a prize! That’s all you need to do; it’s simple and hardly takes any time! So, if you have a penchant for telling beautiful stories through your vacation pictures, what are you waiting for? Log onto Instagram right away, post your favourite photo tagging your travel buddies and stand a chance to win stunning prizes! Launched in July 2006 Cleartrip is the largest online travel company in MENA and among the top consumer internet businesses in the region across verticals. Cleartrip has a large presence in India with industry-leading unit economics, which also serves as the technology and engineering hub of the company, and Egypt which gives it the first mover advantage in the nascent North Africa market. Based on a straight-forward premise of “making travel simple” for its customers, Cleartrip achieves this with a clean and clutter-free website, a site that is fast to load, quick in providing relevant information, simple to navigate and offering an easy booking process. With gross booking value of $1.4 billion, and revenues north of $100 million, Cleartrip is one of the few companies of scale in this space. Cleartrip introduced Alexa skills for its platform in March 2016 becoming one of the first online travel platforms to integrate with Amazon Alexa. Besides numerous other accolades, Cleartrip Mobile was listed in Apple’s App Store ‘Best of 2014’ list and has also been featured as the ‘Editor’s Pick’. In 2017 Cleartrip received the global CX Visionary award at the 12th annual Genesys Customer Innovation Awards.